Today, I put my first sprouting chayote squash fruit in the ground. Well, not quite "in the ground". I used a 5 gallon grow bag filled with a mixture of 60% kitchen scrap compost from my composter and 40% regular garden soil I dug up from my backyard. I placed the grow bag next to my front door in a spot that gets a good amount of morning sun until about 1:30 PM. After mixing the soil, I made sure it was pretty wet but not overly wet or water-logged. I then placed the chayote fruit inside, with its thin end buried and the side where the shoot is coming from poking out. My final step was covering the bare ground with some leaves as a type of mulch to help keep the moisture in the soil. This fruit has been growing this shoot for a few weeks now and now I'm hoping the transition to soil will speed up its growth progression. In a week or two, if the plant is liking its new home, I plan on attaching a hog panel as trellis next to it so that it can grow vertically up and around my foyer. We will see if this little experiment works. This fruit has been growing in my kitchen counter for a few weeks now. I got a bunch of these 5 gallon growing bags. This will be the chayote's new home. Compost to top off the bag after placing the fruit in it. Voilá. Chayote is in the guornd! And a little mulch added to keep soil moist. Yesterday and today, 5 to 6 days after I began sprouting seeds using the paper towel and Ziploc bag method, I began transplanting the seedlings to more suitable homes. Some seedlings went into containers and growing bags while others went into my small growing patch in the backyard. See pictures below for some nice visuals. 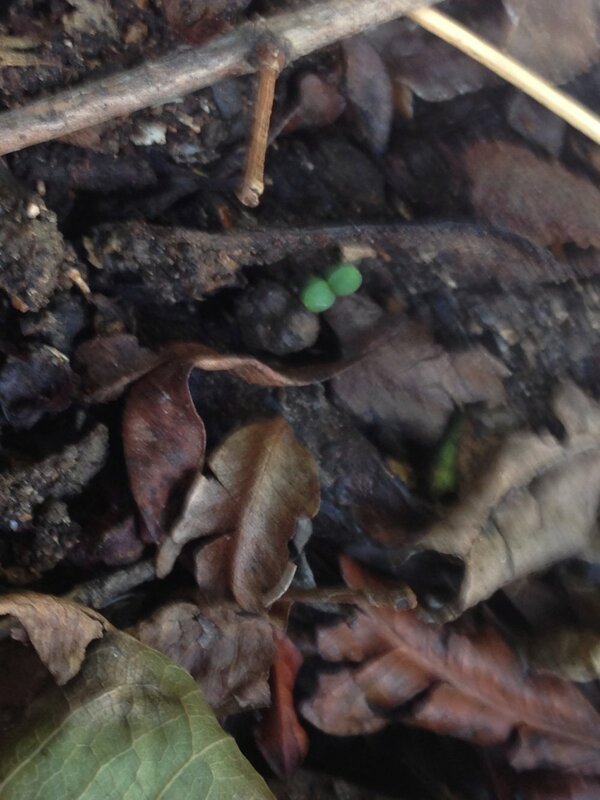 The seedlings from yesterday were planted in some compost and today already they began peering above the soil. Different angle - same plants. That speck of green is some arugula coming up. I think this might be bell pepper but I'm not sure. Also a volunteer. This was a volunteer that rose up unplanted from the compost. This was the first thing I ate from my garden this year. Nice and sweet! Another volunteer that came up on the compost. These grew rapidly in the paper towels and went into the ground today. I was a little disappointed but by no means defeated at this. So, about 5 days ago, I decided to change my methodology. 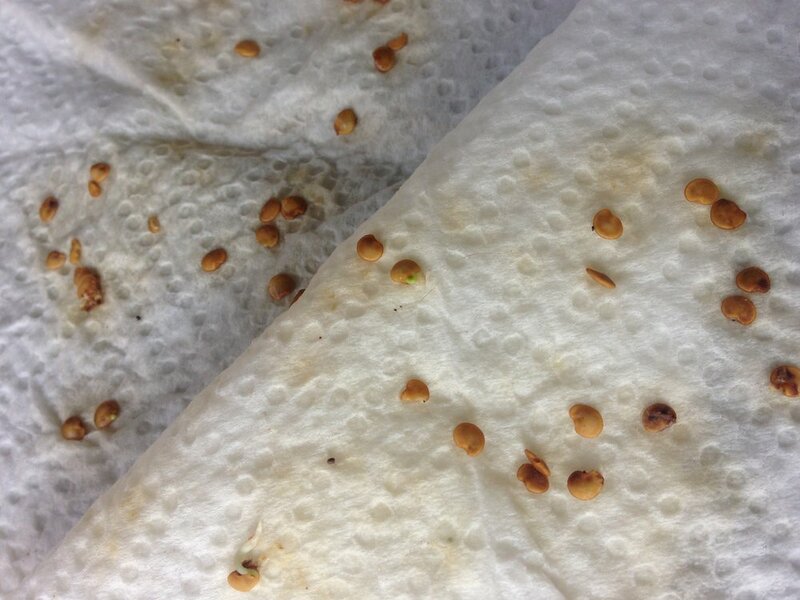 Going to YouTube for guidance and inspiration, I came across an awesome older lady named Mayo that sprouts her seeds by wrapping a handful of them in a wet paper towel. Looking at a related video, I found another guy that uses the same method as Mayo but with one difference: instead of using water to wet the towels, he actually uses a mixture of water and hydrogen peroxide. On the video, he says that such a solution encourages germination. Armed with this new knowledge, I decided to run an experiment. 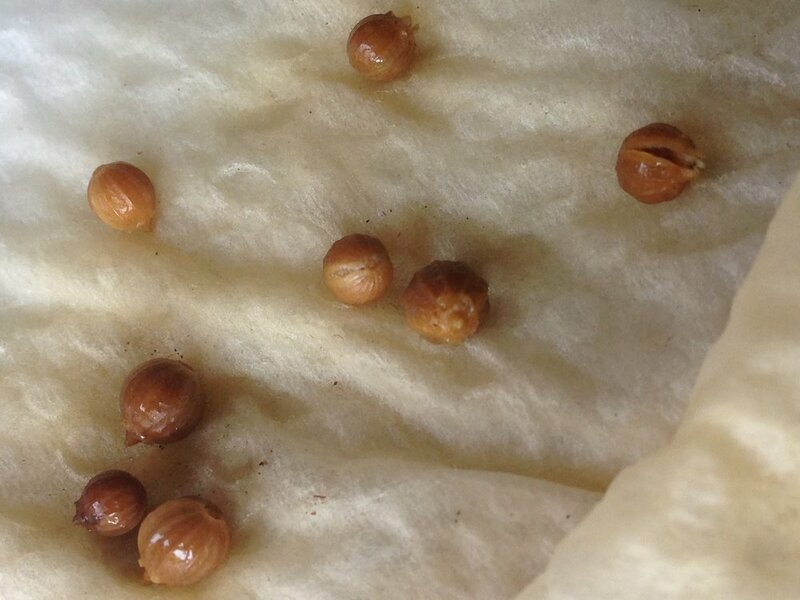 I paper toweled about 15 cilantro seeds on July 8th. 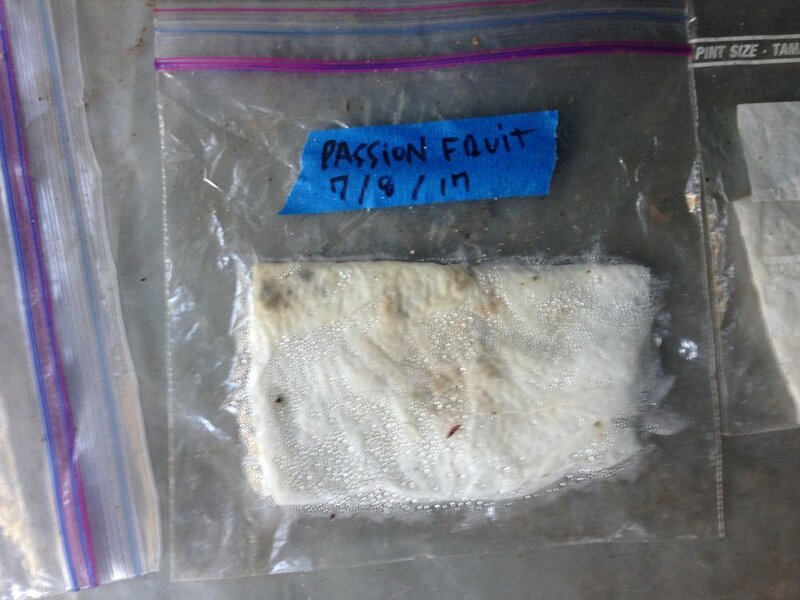 I didn't have much hope for my passion fruit since the fruit I harvested seeds from was quite green. 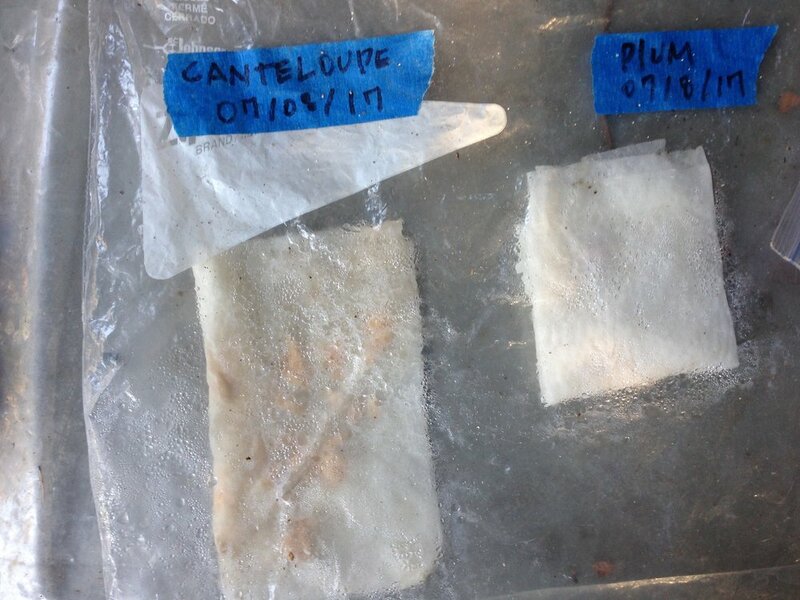 I decided to grow some seeds together in the same ziploc to see if it would work out. Today, July 12, 2017, a full 5 days after "paper toweling" my seeds, it was time to check on their progress. I was very happy to report some pretty good results. See pictures below for details. 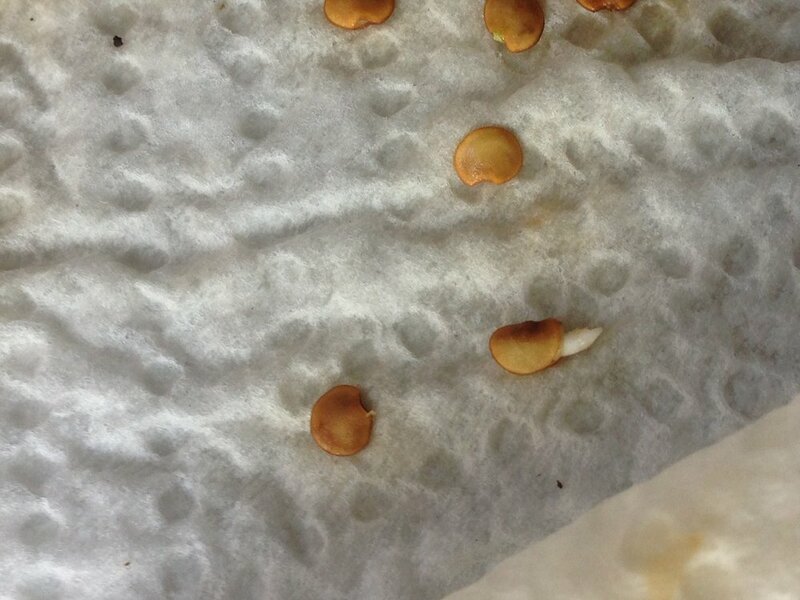 It took only 5 days for the arugula seeds to grow to this size. I began to gently tear the wet paper towels to plant arugula "bunches" together. The most important thing to keep in mind is not tearing the gentle roots. 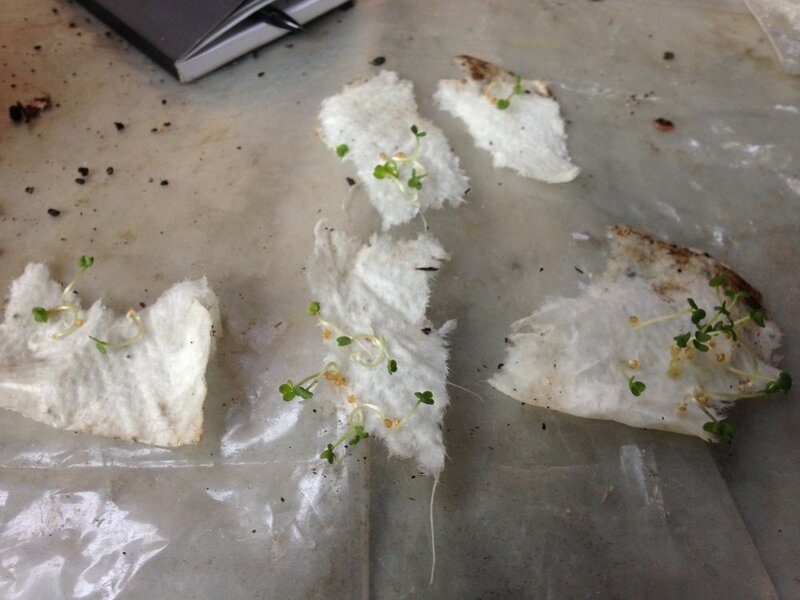 Here's is the fully torn paper towel with all of the arugula growing on it. At first, I didn't think the cantaloupe had sprouted. But then I noticed this guy. 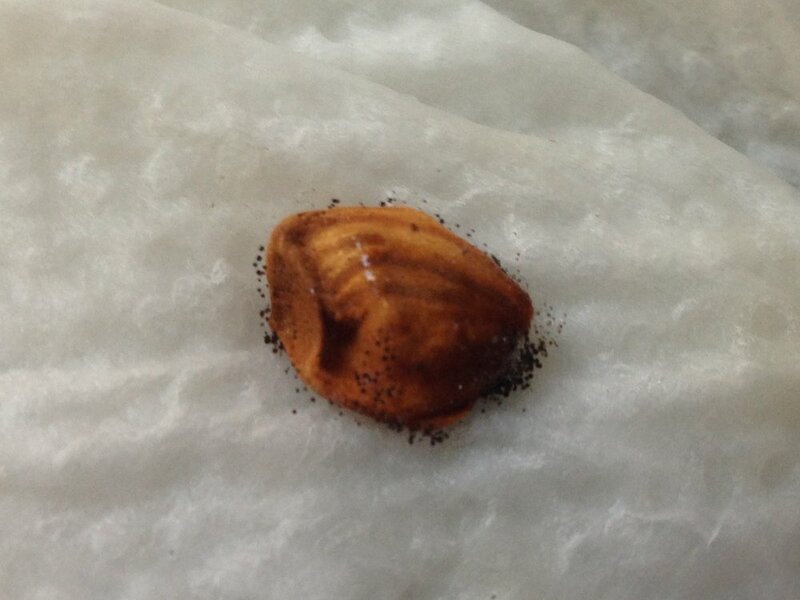 The plum seed became moldy. The wet paper towel doesn't seem to be a good method for sprouting plum. I lost all three seeds I tried. 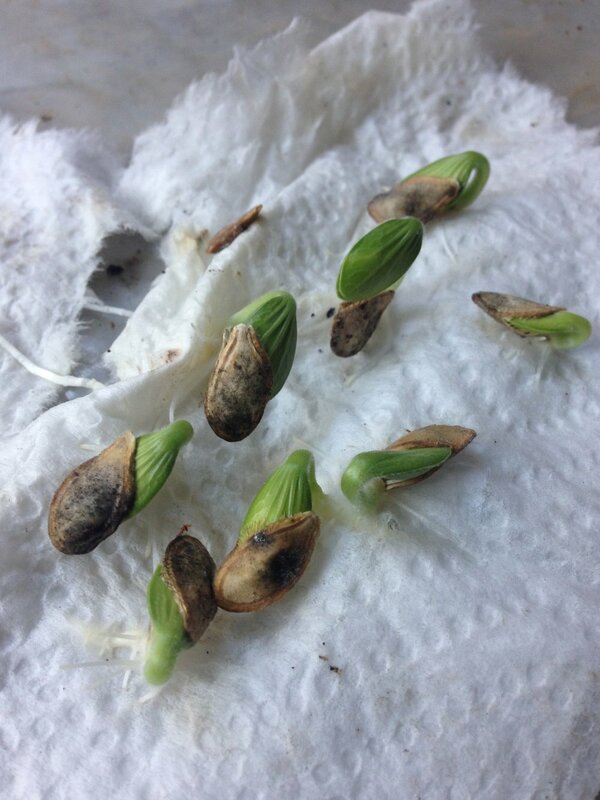 The eggplant seeds were a little slower to germinate. 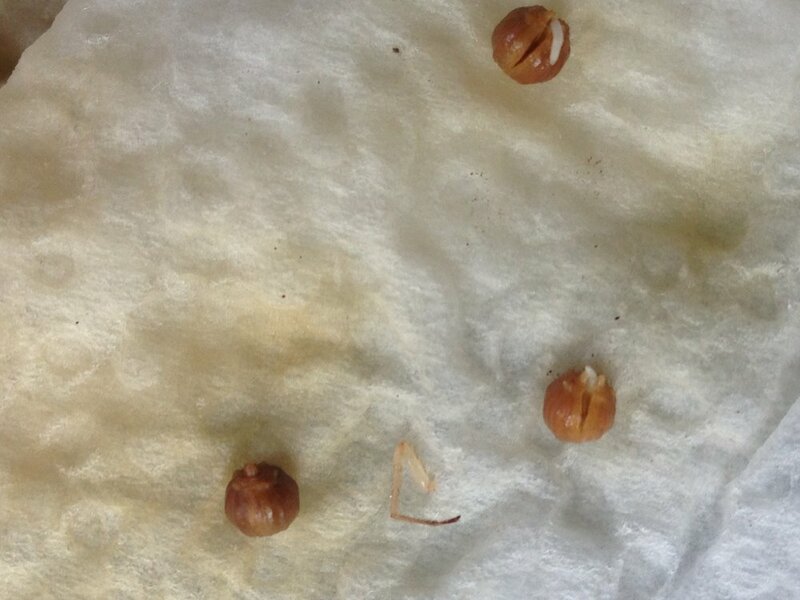 There are some small germination signs here and there but not enough for transplantation just yet. 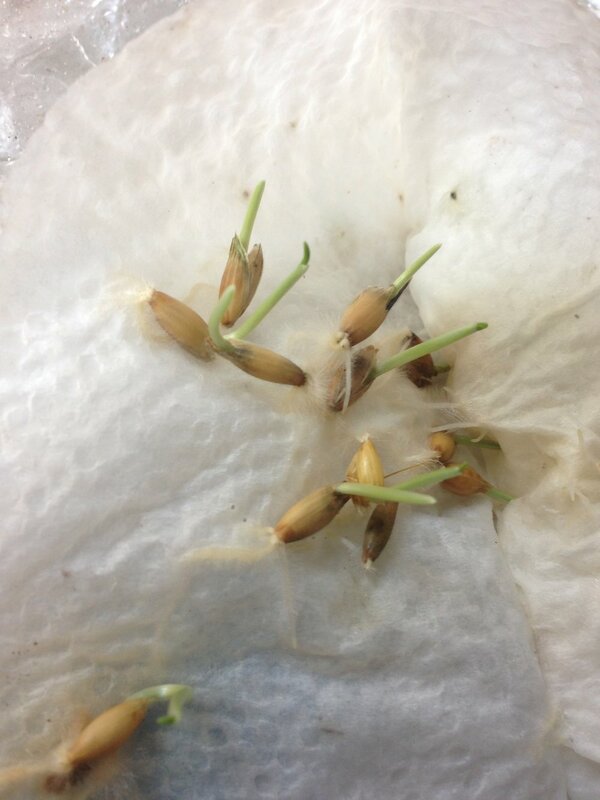 I was surprised at how straight the shoots coming out of the oat seeds were. This seems to be working but it may require a few extra days for roots to shoot out more vigorously. Some of these seeds seem to be cracking. After my first failure, I didn't have much hope for the squash, but they did quite well with this method! Separating seedlings with careful tearing of paper. 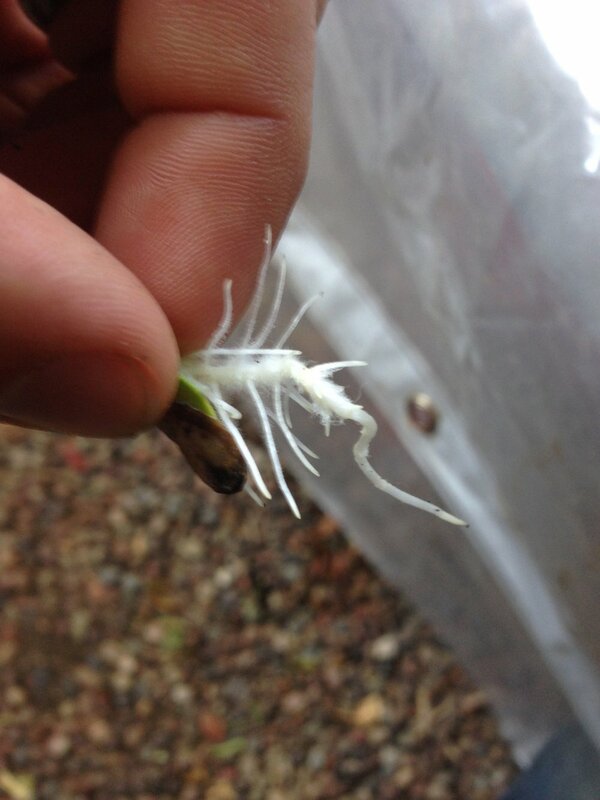 5 day old root growth. Separated and ready to go into the soil. Shoot is measuring about 1 inch. The shoot has tripled in size. To those that don't know, chayote has a very mild taste and is used around Latin America in soups or cooked in some ways like a potato. I found the three chayotes I purchased at a Mexican food store here in Los Angeles and I'm allowing all three of them to trow out a good length shoot before planting them around the house. My plan for them will be to grow them in a 5 gallon grow bag and build trellises that will lead the vine to grow alongside some of my exterior sunny walls on the exterior of my house. I will post more pictures when I actually plant this exotic delicacy. I have started a backyard food garden (again)! So, it has been a few years since I last tried my hand at gardening. Believe it or not, the place where I really took vegetable gardening far was in New York City. Well, Queens actually since garden space in New York comes at a premium. 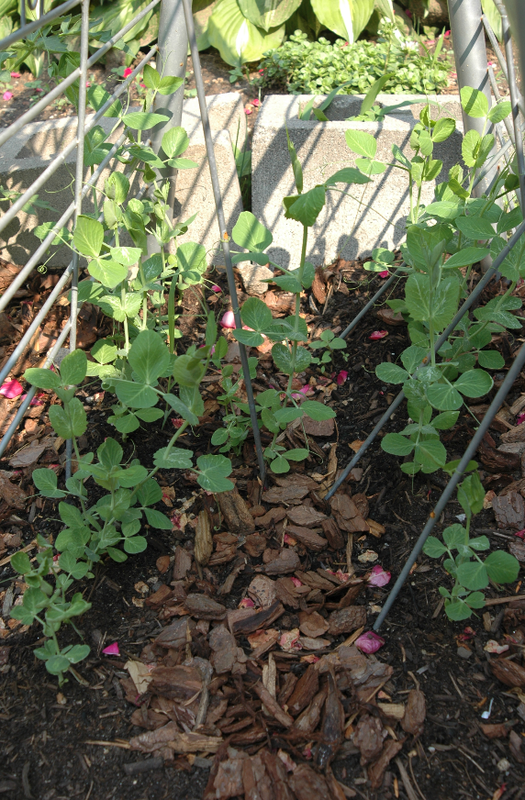 It was around 2008 when, after reading a few books and watching lots of videos online, I started a vegetable and herb garden in the relatively neglected lawn of the apartment building I used to live in Long Island City. I had to grow mint in a pot otherwise it would take over the entire yard. I grew them to fix nitrogen and b/c they are so tasty. A young zucchini plant looking healthy. This plant actually survived four NY winters outside. Detail of flower which becomes fruit. I used to plant in rows when I started out. I grew quite a cornucopia of varieties in my roughly 20' by 20' growing area, including tomatoes, cucumbers, zucchini, mint, basil, cantaloupe, arugula, kale, collard greens and more! But the wife and I ended up moving from Queens to Manhattan (where I had no outside space whatsoever for gardening) and from there to Los Angeles. During my first few years in Los Angeles, I didn't really garden. I was entirely devoted to running my video production companies and didn't interact with plants much other than watering some drought-resistant species I put on the ground in front yard once a week. But recently, after spending some time at my mother's food forest project in Brazil, I came back home to LA with the gardening bug again. Within a day or two of being back, I started to spend a lot of time outside in the backyard, slowly working on it to make it suitable for growing food. One of the first moves was to begin to try to help the soil along. The sun shines bright and hot here in Los Angeles. My garden had quite a few spots of exposed soil, something even an amateur garden like me knows is no good. Over the course of my research, I learned that one of the most important steps to grow edibles was to increase the quality of the soil by making sure it has is covered with organic mulch. This whole area used to have hard exposed soil. These came in the mail. Supposedly they grow to be 10 feet tall. This little guy rooted on his own inside my compost bin. Hopefully they will take eventually. Deep below the compost lay peach, plum and nectarine pits. Exterior view - well protected agains nightly assaults from mice, raccoons and possums! Interior view - notice volunteer cantaloupe plants that sprouted on their own. Hanging on the fence. It never rains in LA, so, why not? Fig tree is finally rooting. It as been slow going with avocados. I'm going to try the wet paper towel & ziploc bag with these guys. Went to the store and picked up some mint, basil and strawberries to liven up the yard. Behind plastic bag to keep moisture in. So, I started by adding organic materials to the portions of the yard where I planned to plant, leaving no bit of soil exposed. I added leaves, light wood branches that I clipped from nearby trees and compost from the food scrap backyard composter which I installed here at the house when I moved in in 2013. One of the important precepts of this new gardening project was to try to do things in a thrifty manner, not overspending on materials and trying to recycle and repurpose whenever possible. So, plastic bags, discarded lumber, food containers and other pieces of refuse began to make their way into my garden to serve important new purposes. In the weeks to come, I will post pictures and text about my backyard gardening adventures that I help inspire you and others to start your own backyard gardens. So far, a mere two to three weeks into it, the work has already been incredibly therapeutic and rewarding. Thank you for reading and feel free to leave a comment below.